Over the past few years, automation has been a major source of discussion in the marketing industry. As more companies learned – and continue to learn – about the benefits of putting certain aspects of their strategies on autopilot, the adoption rate skyrocketed. But even so, there are still businesses out there that haven’t discovered how automated marketing not only attracts more leads, but also improves their customer conversion rate. If yours falls into this category, these 6 stats about marketing automation will provide a solid foundation for what you need to know. In the early days of automation, it was difficult to tell how helpful it was. But now that 49% of companies use marketing automation (53%, if you narrow it down to B2B companies), there’s enough data to understand. 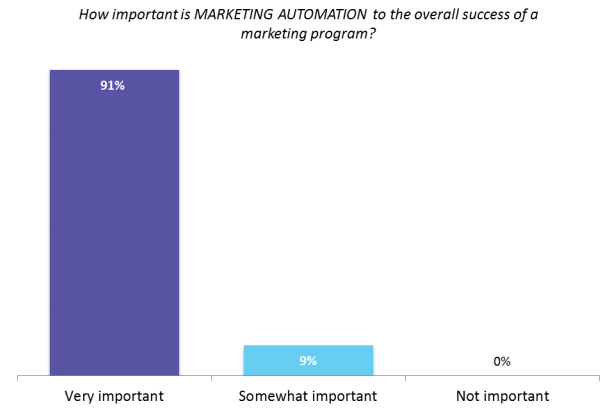 Of those who use marketing automation, 91% say that it is “very important” to the overall success of their marketing. As more channels become necessary for marketers, it can be difficult to launch and manage so many different campaigns. But with marketing automation, you can streamline your efforts and nurture the leads they generate. And considering that 79% of top-performing companies have been using marketing automation for more than two years, it’s safe to say it could have some serious benefits for your business. Regardless of your company’s industry, size, or business model, a 34% increase is huge in terms of revenue. This means that using marketing automation could be a game-changer for your business as a whole. At WebFX, we know this – which is why we’ve created our own marketing automation software, called MarketingCloudFX. It not only provides all of our clients with insight into their site visitors and leads, but also shows their ROI over time. Although this stat isn’t specific to our own clients, we’ve seen firsthand what marketing automation can do for a company’s revenue. And when it comes down to results, there’s really no metric that’s more important. Despite all of the marketing channels that have developed since email, it is still one of the most effective. And with marketing automation, that effectiveness can actually double. I mentioned the importance of automation in email marketing above, but in addition to drip email marketing, there’s another strategy that can be even more effective. With triggered emails – meaning emails that are sent in response to a specific action a user takes on your site – you can experience a 70.5% higher open rate. Not only that, but triggered emails have a 152% higher clickthrough rate than regular email newsletters. This means that by sending an email when a lead fills out a contact from, abandons a shopping cart, or visits a specific page, you can increase the chances that they’ll come back to your site and eventually convert. And although this may sound overly complicated, it’s not. With the lifecycle email marketing abilities of many automation programs, setting up emails to send based on specific actions is completely doable. As a marketer, much of your time is likely spent generating leads for your company. And while this is an important task, it won’t be beneficial unless those leads actually convert. If your company receives a high number of leads (or simply has a small marketing department), it can be difficult to keep track of all of them. And no matter how interested a lead is in your products or services, they’re unlikely to convert without any encouragement beyond their first visit to your site. With marketing automation, encouraging conversion is simple. Good automation software will automatically track all of the leads you receive, and depending on the parameters you set up, it can even break them down by industry and company (for B2B businesses). This will help you determine which marketing messages to deliver to each lead, which will improve your overall efficiency. In fact, 96% of B2B marketers say segmentation is the most valuable method for improving conversion rates. And if you operate on a B2C model, the benefits are similar. 74% of marketers say that targeted personalization increases customer engagement. That means sending content to leads based on their interests could be all you need to boost your marketing effectiveness. If you’re on the fence about using marketing automation, consider your goals over the next year. It may seem like a long time, but 12 months from now, you could experience the results above. So if you knew you could experience a 34% increase in sales, twice as many leads, and a 53% higher conversion rate with just one addition to your strategy, why wouldn’t you use it? 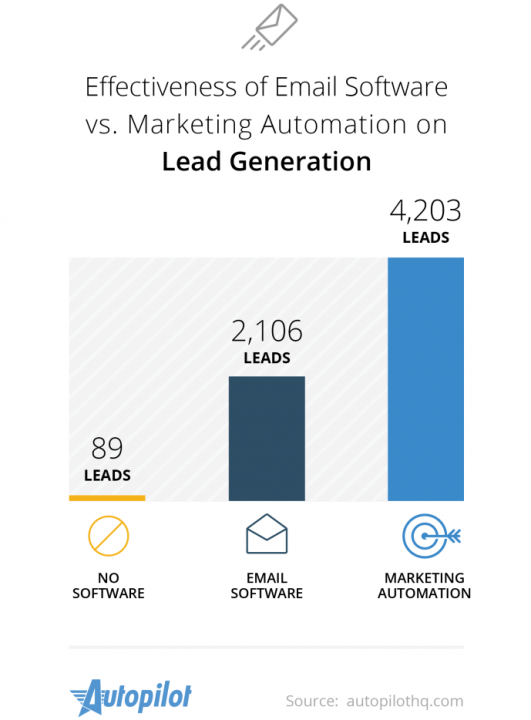 Does your company use marketing automation? If you use automation as part of your company’s marketing strategy, have you seen similar results? And are you part of the 91% who find it important to your marketing success? Let me know in the comments below!